Bold and stunning card, Lynn! You do a very good job with different techniques. This is just beautiful. I don't know if that is the word or not but it worked perfectly whatever they call it. I only tried that once and it didn't turn out so great but I think I need to give it a second try after seeing this card. Wishing you a wonderful day. How beautiful is that!! I love it, Lynn! This is stunning Lynn, the die cut against the black backdrop really makes it "pop". Love it and yes it is called smooching. I will never be sorry that I bought this flower die. It can be used in so many ways, as you show perfectly right here. Gorgeous card, Lynn! 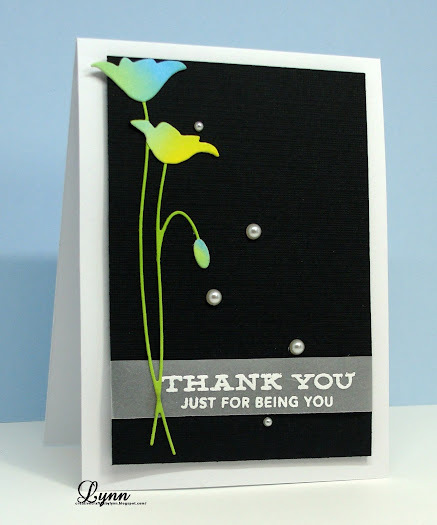 What a stunner Lynn..beautiful colours against the black and love the perfectly placed pearls and vellum sentiment..gorgeous card. This is gorgeous Lynn! I love the colorful flowers against the black background, so beautiful!! Wowza- what an awesome look- so classy! I love the flowers- that die s fantastic. Your pearls and sentiment on vellum are a perfect match to this great card. Love it!!! Your smooching technique is so graceful and smooth and what a lovely colour combo you have selected for it. This card is bold and charming and yet so gentle. BEAUTIFUL! Lovely smooshing Lynn, really pops against the black. Beautiful Spring card! Love the colors on your poppies! Oh, what a great technique, Lynn! I never heard of adding the inks to the die but it really made an incredible looking flowers. I'm going to try that (though I may be contacting you for more detailed instructions.) :-D Gorgeous card, my friend! Oooh! So pretty and classy with those colored flowers on the black background and the pearls and vellum add even more elegance! Like being all dressed up for a night on the town. ooh Lynn, this is brilliant! I never think of black being CAS, always CAS as white space but I love, love, love this! It's so striking and creative. You have always had such a good eye for colour and design so it really is not surprising. Makes me wish I had thought of it! This is beautiful. I love the simplicity. Gorgeous with those shades on the black. Neat flower die. Your card is stunning--I love it! This is stunning. Love the flowers set on the black background. Really makes those smooched colors pop out. Oh Lynn, this is a beauty! So elegant and dreamy - the contrast of the blended colors with the black is just stunning. Great job! Wow, this looks stunning! Love the black background that makes the die cut pop. The pearls add the perfect finishing touch. Awesome! So very nicely done!